Learn more about Oxford's attractions, restaurants, shopping spots, tours and accommodation options. Smart tips and local advices can be found. A medieval city yet full of vibrancy of youth defines Oxford in the United Kingdom. There is more to this old university town than just graduating gowns. It is steeped in traditions and old world charm with spires and halls of ancient buildings transporting travellers back in time. Yet it is a youthful city too, with its huge young student population. The graceful old buildings of thirty nine colleges that constitute the university where the oldest college is more than 750 years old is connected by cobbled lanes, that are narrow and winding and wonderful to walk along and explore. While exploring these hallowed grounds you will be enchanted by the serene courtyards that are enclosed within the old university walls. 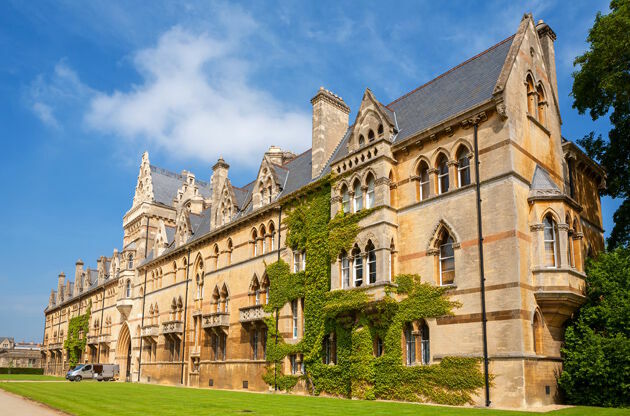 Beyond just being an august place of learning, Oxford is also a city with rich history, traditions, avant-garde art, gothic churches, wonderful museums and superb dining experience. Oxford is a great city to explore on foot with the most important architectural splendours located in the city centre, while the modern and suave Jericho in the north-west is a popular destination if you are attracted to modern art galleries, up-market restaurants and glossy bars. Summertown is also a trendy destination with great restaurants and bars while Cowley Road represents the working section of an industrial Oxford and is very diverse ethnically, and is choc-a-bloc with economical places to eat and assuage your thirst. From the academic calm of the university quadrangles to the tranquil charm of the gothic churches with their famous spires alongside a lively modern lifestyle accentuated by the student community and the manufacturing industries, all set in the picturesque countryside of Oxfordshire make this an ideal holiday destination for travellers who want to savour the old world in a modern setting. This old university town is in the county of Oxfordshire and is about 50 miles away from London. The Rivers Isis and Cherwell flow through this charming medieval city and are very popular sites for punting amongst the students who study in the University. Oxford is well linked to London and Birmingham by both train and bus and is a very important tourist destination in the United Kingdom. How to Get to Oxford? While travelling to Oxford it is best that you choose Heathrow or Gatwick as your port of entry, or even the Birmingham airport, if you are flying commercial, but if you are flying your own plane or using charter service then you can use the services of the Kidlington Airport in Oxford. For the convenience of visitors who want to reach Oxford directly from Heathrow or Gatwick, there are comfortable bus services run by the Oxford Bus Service that run at approximately 20 minutes interval. You could choose to drive down to Oxford from London via the M40 highway, though driving on the wrong side of the road may take some getting used to. The stretch is of 50 miles and can take between an hour and an hour and a half. It is also important to know that getting into Oxford and parking there can be difficult because of stringent traffic restrictions. Alternatively, you could also choose to travel to Oxford by buses that ply between Oxford and other parts of UK. These are comfortable, frequent and economical too. You could also choose to travel to Oxford by train, which will prove to be an interesting experience as you would be treated to the view of the British countryside outside and a glimpse of the British way of life within the railway coaches. You could easily avail of the trains travelling to Oxford from the Paddington Station in London which would be cheaper if brought online. There are a multitude of experiences that will uplift your mind and soul awaiting you in Oxford. If you have limited time, it is worthwhile to at least visit one museum and one hallowed learning ground–and maybe let your spirit soar as you listen to a college chapel choir. Other places that should be a part of your itinerary would be the Bodleian Library – one of the most ancient in Europe, the Bridge of Sighs or the Hertford Bridge, Sir Christopher Wren’s Sheldonian Theatre and the thirteenth century University Church of St. Mary the Virgin. Your visit to Oxford will remain incomplete without visiting the famous colleges of Oxford like the Merton, Magdalen, All Souls, Christ Chiurch or the Balliol, each rich in history and lore. While most Oxford colleges will allow you to visit there may be time restrictions and it would be wise to check these beforehand to avoid being disappointed. Oxford is a modern town deeply rooted in history and traditions, which is well reflected in its plethora of Museums, each with a fascinating collection. The oldest British museum known as the Ashmolean Museum is located here and has a display rivalling the best museums in Europe. Also, not to miss is the Christ Church Gallery with its famous collection of paintings and drawings by Old Masters. Do not miss the Covered Market in your shopping sojourn. The Covered Market is indeed a covered market which has been in existence since the 1700s and now houses meat, fish, fruits and vegetable sellers along with little boutiques offering everything from hats to shoes. If you are a cheese connoisseur, then the Oxford Cheese Shop has to be in your list, and if you are looking for some fashion then the Covered Market and Cowley road should be your destination. After a full day’s visiting sites and shopping, as the sun goes down, it is time to rejuvenate the body with some good food and drinks in the narrow cobbled streets of this medieval city. There are a number of pubs like the Turf Tavern where you can quench your thirst and slake your hunger, you can also sample the food at Ajax Diner or try out the well-known chicken-on-a-stick. If you are looking for a fine dining experience, then Malmaison is right up your alley. And for some lively action you could take a walk along George Street but it can get a little rowdy at night. Oxford is well located for day tours or short trips too. While being based in Oxford, you can plan a trip to Stonehenge which is about an hour away and feel the mysticism in the air, or visit the Blenheim Palace with its numerous attractions including the pleasure gardens and the mazes. If you have a green thumb then you must plan a day trip to the famous Waterperry Gardens to be enraptured by the beauty of the surroundings. Being an academically rich city, Oxford is a perfect hub for academic events like conferences, congresses, symposiums as well with business events like fairs and exhibitions. Its easily accessible location and cultural richness makes Oxford a matchless venue for all kinds of these international events. Plus, the high capacity of luxury accommodation options and the numerous event venues that offer the highest standards and equipped with the latest technologies makes Oxford highly advantageous as a host city of global events.